Brewing Beer in Belgium with Bryan ... the finale! Having had so many memorable experiences in just the first two days here in Belgium, it’s outrageous to believe it only gets better from here. Guess what? Things got better because we entered Day Three which is the day I’ve been looking forward to most since learning about this trip months ago. I leaped out of bed before my alarm sounded and got ready to depart Bruges for Bavikhove, home of Brouwerij de Brabandere. 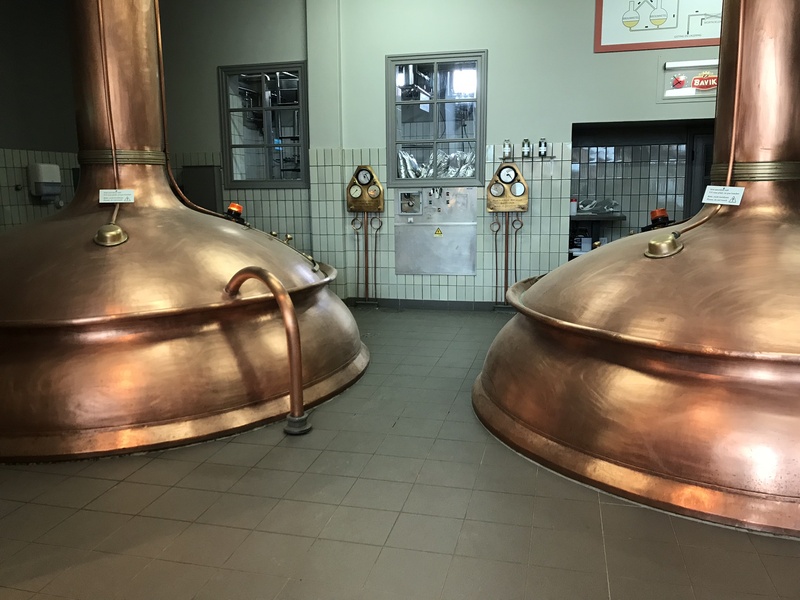 Many famous beers come from this brewery such as Petrus Aged Pale and Roodebruin, Bavik Super Pils (which totally lives up to its name) and Wittekerke Witbier. Interesting thing is that the brewery has become very aware that the brands they produce are well known and trusted to be great, quality beers, but the brewery name is not. This point is not lost on me as when I mentioned to beer lovers where I was going. The reaction to “de Brabandere” was a general blank stare but once I mentioned “Petrus”, eyes lit up. This is very common in Belgium. De Brabandere wants people to associate its name with trusted quality as strongly as its brands. I can’t blame them because they are very good at what they do and they do it with passion and conviction. Fifteen travelers in various states of ‘feeling last night’ boarded the charter bus to make the quick 45 minute trek to Bavikhove; all equally excited for the day ahead. We were eager to learn the history of this family brewery founded in 1897, tour the impressive facility, sample the beers and to experience the creation of a collaboration beer brewed to be the official beer of Philly Beer Week 2018. Over the past month or so, I’ve been working with de Brabandere Brewmaster Pieter Maes to formulate a recipe that would capture the spirit of each brewery, and to marry key characteristics of our unique brewing styles and skills. The beer will be served in the sticky, hot Philly summertime so we knew the beer had to be drinkable and refreshing. I have a long, well documented and gold medal awarded love affair with Saisons. De Brabandere has never made one as it’s located in West Flanders and Saison is a Waloonian specialty. We naturally brewed a Saison. Pieter suggested blending some of the sour aged pale from their foeders into the beer during maturation. This extra tartness will enhance the refreshing character of an already refreshing beer style. I started drooling thinking of the delicious possibilities of that, so I immediately agreed. As you may be aware, at Dogfish Head, we love to bring new flavor experiences to life with many thoughtfully selected off-centered ingredients. I felt the addition of black pepper and jasmine flowers would bring zingy spice and floral perfume nuances to the beer, providing intriguing complexity. Pieter was all in because he’s never done that before and he’s curious about the sensory possibilities of beer. With all of the ideas in, our recipe was born. We arrived at the brewery just in time to mash-in the grist of three malts: barley, wheat and rye. The brewhouse is a really unique combination of equipment dating back to the 1950s and modern vessels installed in 2008. Full automation was implemented in 2006 on the original 1950s brewhouse in anticipation of the installation of the new, modern lauter tun and boil kettle. The original mash tun is still in use for its intended purpose and the old kettle is now a wort receiver, which enabled the brewhouse to send 150 hectoliters (about 3,974 gallons) of wort to fermentation every 2.5 hours. They are currently brewing around the clock 4 days a week which means they have plenty of capacity for future growth. They have an amazing museum piece in their former lauter tun with its copper top and open grant. Framed in old tile, it’s a beautiful sight to behold. This year, the brewery will produce about 188,000 barrels of beer, 60% of which will be Bavik Super Pils. Most of their Petrus sour beer production is exported to the U.S. The American demand for their sour offerings has resulted in a massive increase in production capacity for these beers. In the past 4 years, they have constructed a new foeder hall investing in more of the giant wood tanks to just about triple the number they had. That’s a lot of wood! The introduction of new wood tanks at de Brabandere does not result in an immediate return on investment or increase in availability of beer. It takes four years for each of their new foeders to yield sellable sour beer. Beer sales from older, established foeders is reduced because two year old sour beer is removed from them and placed into a new foeder and allowed to sit in the new foeder for two years in order to thoroughly inoculate the wood with the signature microflora which perform the fermentation of the sour pale. It’s another two years until actual ‘new’ beer completes its fermentation in the new foeder. Four years to experience a production increase from at 25,000 Euro per foeder investment. This is certainly a hard pill to swallow for the folks who sign the checks, but a necessary pill nonetheless. A few hours after the mash was mixed, we had wort ready to boil in the kettle. 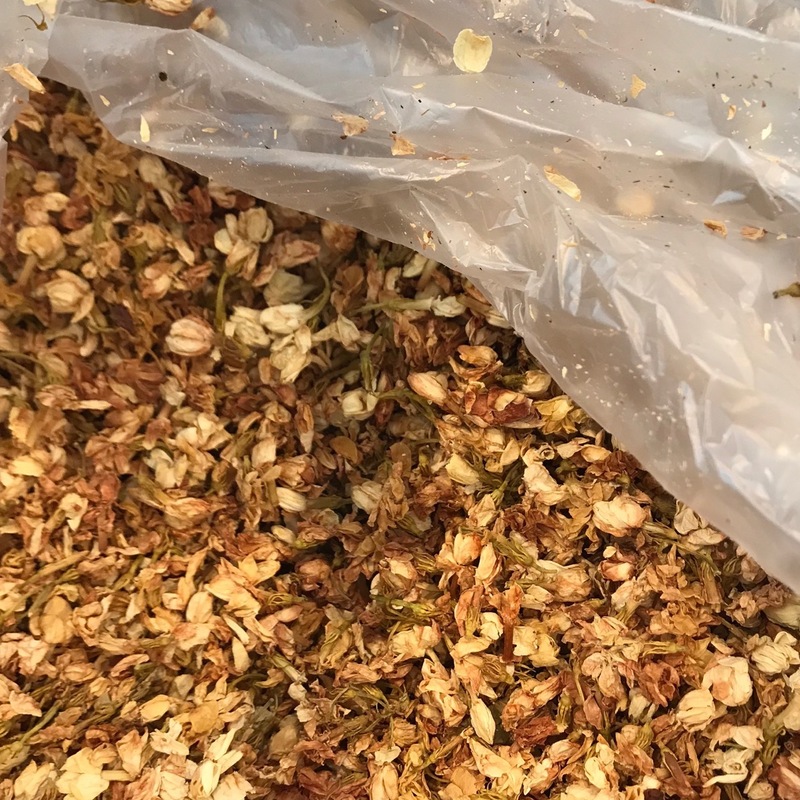 We hopped the wort with a good portion of classic Saaz hops for its floral and gently peppery character. After about a half an hour we were to add the black pepper and jasmine. The jasmine flowers were rich with delightful perfume and the black pepper smelled minty and fresh. Wait…what?!? The label read “muntpeper”. Peppermint. Well, I discussed it with Pieter and we determined that something got lost in translation and that we’d forego the peppermint. Thank goodness we caught that. That would have been jarringly not good. The jasmine flowers were added with a few minutes left in the boil and about 45 minutes later, we had nice cooled wort to sniff and swish. The wort smelled herbal and sweet with a flavor of malt, subtle herbal green tea, seductive perfume and pleasant hints of rye spiciness. I am very much looking forward to fermentation updates from Pieter. We were both quite pleased with the wort and are excited to see what the selected saison yeast brings to the party. As I mentioned, we plan to blend this beer with a percentage of sour pale from the foeders and since this is a collaboration, it is only logical that we both should have input as to the actual blend. It would be impractical to plan another trip in a month (however tempting that may be) so Pieter will send us samples of the fermented saison along with some Petrus Sour Pale so we can perform sensory tests on different blends. This will be an amazing way by which we can bring more co-workers in on the collaboration, which bears the Dogfish name. I don’t know if you can tell but I am super psyched to share this beer with everyone. It was such a pleasure to formulate and brew with my new Belgian friends and I am honored to have been chosen to represent Dogfish during this project. I am especially thankful for the opportunity created for us by Philly Loves Beer and Global Beer Network through the Philly Beer Week fundraising raffle, and to Nick Kilkenny for thinking so much of us so as to nominate us for this honor on his raffle entry. The trip is now coming to an end and I’ve got eight and a half hours on a plane to reflect on the good times shared with my fourteen newest friends. Many glasses were clinked, meals shared, miles walked and frites devoured. This is definitely one for the ages. One to be preserved in liquid form, if only for the Summer of 2018. I cannot wait to relive glass after glass of those memories.